Keep your car cover in great condition so it can protect your vehicle for years to come with storage bags and locks. These car cover accessories are must-haves to maintain the longevity of your car covers. These bags are fashioned with drawstrings that close tight and give you a place to keep your cover when it’s not in use. 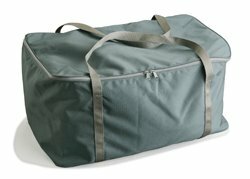 Affordable, durable, convenient storage bags make storing your car cover simple. Select your car cover’s material and color below. What better way to extend the life of your car cover than by safely storing it away in a storage bag, and locking it in place when it’s on your vehicle? The storage bag and lock kit combo allow you to extend your cover’s life, store it conveniently, and deter theft, protecting your investment in both your car and your car cover. 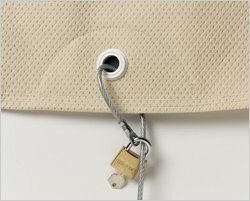 Select your car cover’s material and fabric below. Made in two sizes depending on the size of your car cover, these zippered tote bags make it easy to store and haul your automotive cover. The sturdy web straps make it easy to move your car cover from place to place, while the polyester vinyl-coated fabric protects your car cover from the elements. Select small for single-layer woven fabrics or large for multi-layer fabrics. Works on any brand of cover. Kit includes vinyl-coated steel cable and padlock.